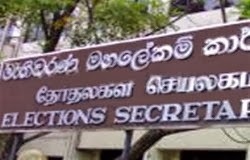 The Election Secretariat has informed the relevant parties who won seats in the Provincial Council Polls to submit the names of candidates for the bonus seats. Deputy Election Commissioner M.M. Mohamed said that two seats will be allocated for each party that won, in each of the respective provincial councils . Therefore two names of candidates who contested the elections which were held over the weekend but failed to secure victory must be submitted. Mohammed added that the relevant parties can decide which candidates will receive the bonus seats.